to safeguard your fortune, health, romance, and family. the famous two-headed doctor from Arkansas. The weather has been lovely, we have had many visitors, and the painting is still not done! There are a lot of other good things to report, however, so while Chris and Roger slowly glide through the interminable gilding project (six coats of paint on every gilded surface! ), let's take a look at what's happening all around them! This special Guest Article was written by Donnalee Slusser, owner of Tiffany Wigs in Homosassa, Florida, where you can not only purchase beautiful wigs, but also pick up Lucky Mojo spiritual supplies! I have a little cleansing trick, I call my "Quick Fix". I use this between my regular herbal spiritual cleansings. The "Quick Fix" is certainly no substitution for a full-fledged spiritual bath, but it may prove useful to those who want to perform spiritual bathing "on the go." 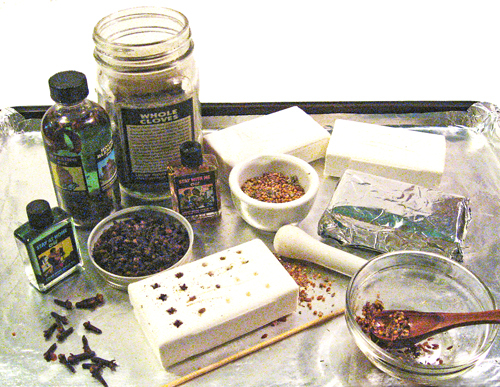 This method helps me to make my own spiritual intention soaps for very little money. I buy Ivory Soap, original white, which is "99.44% Pure," in multi-bar packs. I get maybe a dozen bars at a time. I use white Ivory Soap only, as it is pure in color and Is somewhat like stem cells in regards to taking on the identity of what is put in it or attached to it, so it therefore grows with my intentions and prayers. I lay out aluminum foil on a cookie sheet. I place the bars out and take a bamboo skewer stick and I make 4 holes across each bar and 5 rows down each bar, for a total of 20 holes per bar. I am careful not to go all the way through to the other side. Because the Ivory Soap is so soft this is easy to do. I usually make up my soap bars in batches of three: 3 bars for blessings, 3 bars for prosperity, 3 bars for success, 3 bars for protection, 3 bars for spiritual gifts, 3 bars for love, 3 bars for spiritual cleansing, and so on. Once I decide which conditions I wish to work on in my batches, I select my condition oils and herbs. I generally blend several condition oils together to address the various facets of a given condition. For instance, if my intention is success, I might blend Crown of Success Oil and Victory Oil, but if I felt that I needed to manifest more personal power or leadership skills to achieve my success, I might additionally blend in a hint of Power Oil or Commanding Oil. If my intention was cleansing, I might select Van Van Oil along, but if I felt under spiritual attack, I might blend in a little Reversing Oil or Run, Devil Run Oil to the Van Van Oil base. By the way, Lucky Mojo sells oils in the form of 4-ounce Rootworkers Specials in which you can select any combination of one, two, three, or four condition oils you like, which are then pre-blended in the shop. These custom-blended 4-ounce Rootworkers Specials are much more economical than buying eight half-ounce bottles of oil, and they last a long time. I next mix a little bit of appropriate herbs in with whatever condition oils I'm using. I can add individually chosen herbs, selected from the lists of herbs for each condition in "Hoodoo Herb and Root Magic" by catherine yronwode, or I can use the various Herb Mixtures that Lucky Mojo prepares, such as Gambler's Gold, 13 Herb Bath, Love Herbs Mixture, and so on. I can also blend the Lucky Mojo herb mixtures with individual herbs of my choosing. If necessary, I grind the herbs up to a uniform consistency in a mortar and pestle or electric coffee grinder. I blend the herbs into the oils, making a thick paste of them. For instance, to make a prosperity and luck soap, I might combine Lucky Mojo Money Drawing Oil, Fast Luck Oil, Prosperity Oil, Wealthy Way Oil, and any other money-luck oils I like. To this I would add money-luck herbs such as Cinnamon, Nutmeg, Allspice, Chamomile, and Five Finger Grass, or I might use Lucky Mojo's 7 Herb Bath Mix and Gambler's Gold herbal bath mix -- or a combination of any or all of these. As another example, I usually make 3 bars of Lucky Mojo Follow Me Boy soap, which is my personal favorite of the Lucky Mojo love oils, but needless to say, you can blend together several love oils -- such as Love Me, Dixie Love, Fire of Love, and Kiss Me Now -- to manifest your own personal intentions for love. You can then add Rose Petals, Juniper Berries, Spikenard, Damiana, or other love-drawing herbs, or grind up some of Lucky Mojo's Love Herbs Mix -- or combine your own personally selected love herbs with the Lucky Mojo herb mix. I say Psalms while I am infusing and preparing my spiritual soap bars, and the Psalms are those that are appropriate to the condition. The one Psalm that covers most situations is the 23rd Psalm. You can read more about the use of the Psalms in the book "Secrets of the Psalms" by Godfrey Selig. After combining the oils and the herbs, I fill each hole with the oil-herb blend. I then plug each hole with a whole clove. Once the holes for the 3 bars in each batch are filled and plugged, I rub the bars all over with a dab of oil and wrap them in foil. I then rinse the oils off my hands and prepare the second, third and subsequent batches the same way. The bars keep nicely when wrapped in foil. I use these spiritually prepared soaps every time I take a shower. The oils and herbs are delightful, and the Cloves act as a exfoliant. I push the cloves in deeper as the bar gets smaller. These bars really last a long time. When I am going to buy lottery tickets I shower with the prosperity bar made with blended money drawing and gambling luck oils. 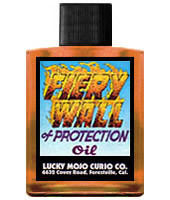 If I am facing a difficult day I would use a protection bar prepared with Fiery Wall Of Protection Oil, and so on. I use these bars for daily cleansing in between my regular herb baths -- which is why I call them my " Quick Fix" cleansing trick. As all we know, "Cleanliness is next to Godliness" -- and Ivory Soap floats! Thank you, Donnalee, for this article. Special Thanks also to Carin Huber of the Lucky Mojo Curio Co. for making up the batch of Blessing Soaps shown in the photo -- and then taking the photo! * Oran Davis is a name that some of you may recall from his days working in the shop lab. 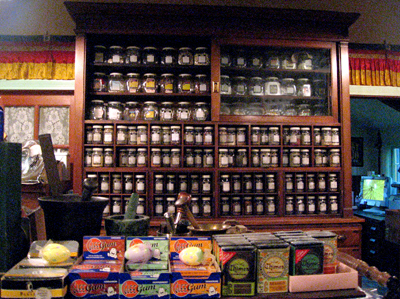 Oran held down a part-time job at Lucky Mojo crafting hand-made oils, incense, sachet powders, and incense powders while also attending college, where he studied computer science. Well, all that study has paid off because Oran is now a dynamic freelance programmer and he has created the most AMAZING Online Prayer Request service for The Crystal Silence League and all the churches associated with it. CHECK IT OUT! � Last month long-serving Deacon Nicole Sanborn bid farewell to Missionary Independent Spiritual Church (the Smallest Church in the World, right next door to Lucky Mojo). This month we offer a heart-felt hug to her replacement, Mother Katrina Mead, who happens to the big sister to our beloved Order Entry Wizardess Della Mead, known to those in our BlogTalkRadio chat room as "LuckyMojoCrew"! � OH! And lest we forget! Della's Fella (his name is Colin) just popped the question and Della said YES! and she is sporting the sparkliest Antique Art Deco Diamond Ring we have seen in many a year! Congratulations, Della! The wedding is set for August of 2012! � This month we will also bid farewell to our long-time shop team member Tracy McClendon. Tracy's job as a mom is claiming more of her time right now, and she leaves a big hole in our hearts with her departure, but we wish her all the best -- and we welcome her replacement-in-training, Shauna Gray, who is studying under Tracy both how to pull orders and how to "do what Robin says." All that's left to say is -- be sure to claim your savings with this month's Discount Coupon!